Ah yes, the Necromancers. Those petty little magical people who are so in love with Death that they want to knock down the barriers between the living and, well, the dead. And now they’ve got someone to do it: a Death Bringer named Melancholia St Claire. With the Death Bringer on hand, the Necromancers hope to usher in the Passage and bring on the new and “glorious” world by killing three billion people. Not so fun if you’re one of the three billion. And that, my friends, is why our favourite Skeleton Detective and his accomplice, Valkyrie Cain, are out to stop them. The best authors make us, the readers, love and hate them. In the case of Derek Landy, this is all too good a description. It’s hard not to love Landy for his excellent wit and writing, but at the same time I care so much for Valkyrie and Skulduggery and Fletcher and the lot, that anything Landy does to hurt them or bring them down is so offensive to me that I just want to beat him up for being so mean to his own characters. It has been said and it needs saying again: this series gets better and better as it progresses. Skulduggery Pleasant was a good start. Playing With Fire was good, but too similar to the first. The Faceless Ones picked things up again.Dark Days catapulted the series into new (awesome) territories, and Mortal Coil vaulted Skulduggery and Valkyrie into excellence. And Death Bringer? If there is such a thing, then Death Bringer is beyond excellent; it’s a masterpiece perhaps, of modern middle-grade-come-young-adult writing. And one that you can’t put down. 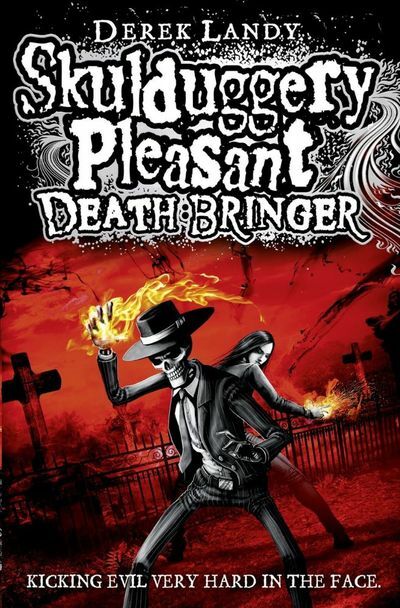 Skulduggery Pleasant: Death Bringer also sees Landy bring an excellent compromise between the dry humour of Skulduggery and Valkyrie and the brutal nature of the story to create an intense bathos. Plenty of scenes are deliciously violent and hard-hitting, but these are offset by some hilarious jokes. The Skulduggery Pleasant series has always been something of a black comedy, but none of the previous novels have ever truly gotten such a fantastic contrast between the funny and the deadly. Few authors manage to outdo themselves with every book they publish, but Landy seems to be one of them. 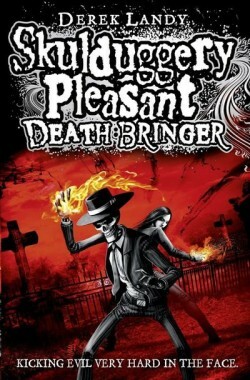 Skulduggery Pleasant: Death Bringer is above and beyond what anyone could have expected. With one epic saga of a storyline and with characters who are growing to be ever shady-er, Death Bringer is an excellent novel. I can only hope that Landy continues to write so fantastically well.